Introducing this DIY home security kit by PiSector. 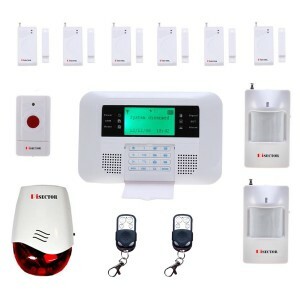 It features the GSM06-S 2-in-1 Cellular Wireless Security Alarm System with their Double Protection Auto Dial Kit S. This is a very affordable system. 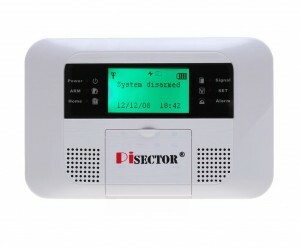 The PiSector GSM06-S is a complete wireless system, which allows you to completely control the system via remote. You can monitor your system without having to pay any monthly fees. The system will contact you if it detects a breach in security. If will contact you at up to 6 landline numbers and 3 SMS numbers. It has dual network protection, should one system fail, and also if you do not respond on one network it will try to reach you on the other. With this extra layer of security if a potential intruder tries to disable your land line your system will still stay enabled due to it’s GSM capabilities. The alarm system will also engage the siren if the land line is cut or goes dead. You can also make use of the intercom function to remotely dial into the system and talk with anyone in your home/property via the intercom. Naturally you can also deactivate the system or arm it remotely, and get a status update. An optional upgrade also allows you to lock/unlock your front door via an electronic lock system (purchased separately) – works via mobile phone anywhere/anytime and also utilizes the land line. Complete Wireless Technology – includes integrated GMS dialer. Turns on alarm then calls your phone or forwards to a text in situation of a potential break in. Landline has anti-cut security protection built in. Remotely monitor your surveillance system – call in for a status update, from another location, utilize the intercom feature and arm or deactivate the alarm system from a smartphone/wireless/internet connected device. The power blackout caution system will utilize a backup electric battery to contact you in a power failure situation. Wireless siren is loud enough to alert neighbors and warn off trespassers. Console is small enough to easily conceal and is rugged enough to withstand breakage by force. Daily Arm/Disarm Plan permits you establish a timetable system for auto-arm and also auto-disarm functions. AC/DC adapter, Power Input 100V-240V, Power Output 12V 1.0 A. Motion activity sensing units powered by 9V Square electric battery containing an LED light to display low battery warning. Door sensing unit powered with 23A 12V battery with low battery LED warning light. 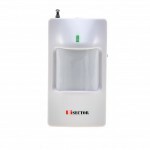 Motion Sensors detection range of open space is 25-35ft, Upright: 60°, Horizontal: 110 °. A relatively simple to install and operate complete home alarm security system. It makes great use of GSM technology, so there is a backup if your land line goes dead. It also can detect if your land line is cut, and this is a fantastic feature fro the price. It also has an intercom function and this is a good feature to see in a home alarm system at this price.